Turning up the volume in Fitzroy this November is Glamorama – a venue that’s about to re-energize Brunswick Street with a complete offering for food, drinks and music. The new space on the block has a focus on electronic music, a full kitchen and a huge drinks list. The team behind South Yarra bar, Less Than Zero, Simon Henderson, Jeremy Koadlow, John Ryan and Anthony Cannan, saw an opportunity to bring electronic music to the inner north. With a license that lasts until 3am during the week and 5am on weekends, they’ve also created a place to call home any time of the night. Renowned touring agency Novel has teamed up with Glamorama to guarantee the best in electronic music at the new space. Their combined expertise will bring Melbourne’s most reputable purveyors of disco, house and techno from the North and South together. Local legends will feature strongly alongside huge international acts and parties by notable crews. Confirmed international artists are Ben Pearce, Dense & Pika and H.O.S.H, with more big names to be announced. 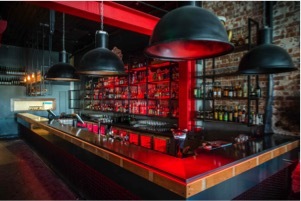 Glamorama’s sound system is a premium point of difference to music venues across Australia tailored towards electronica. Artists, DJs and producers will play through a full Funktion-1 sound system installed by Full Throttle, the company behind the setups at Strawberry Field, Rainbow Serpent and Let Them Eat Cake. The drinks list will be as impressive as the music offer. The boys from Glamorama have scoured the far corners of Australia and are proud to offer the largest range of Australian whiskies in one place. Guests can name-drop prestigious brands such as Sullivans Cove, choose from smaller local distilleries like Bakery Hill, sample rare lines and indulge in barrel-aged cocktails. Glamorama will also focus on providing delicious food thanks to head chef Shaun Hansen, previously of Sweet Water Inn. Hansen brings years of experience in casual and fine dining cuisines, so guests can expect high-quality, reinvented versions of familiar dishes, served with intriguing and humorous twists. 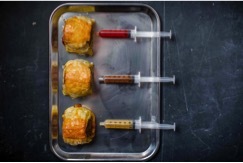 Think vegan chicken wings and lamington-fried ice cream, or Botox pies with sauce syringes. Glamorama is perfect for a complete night out. A venue of craftsmanship and intelligent design, Glamorama allows visitors to get lost among its various spaces. Guests can shut themselves away from prying eyes in their own private booth, party until the small hours on the large dance floor, or chill out in the bar, all while a gig goes on in the next room. Open until 3am during the week, and 5am on Fridays and Saturdays, there are less than zero reasons not to check out Glamorama. The better you look, the more you see.